APODIO is a GNU/Linux operating system containing audio, text-friendly, graphic and video tools. It can be used as a liveCD or be installed on a partition of your hard disk. This workshop is an introduction to Apodio and its possibilities. Participants will also learn how to send audio streaming over internet in real-time and to perform new score using OSC in collaboration with the group. 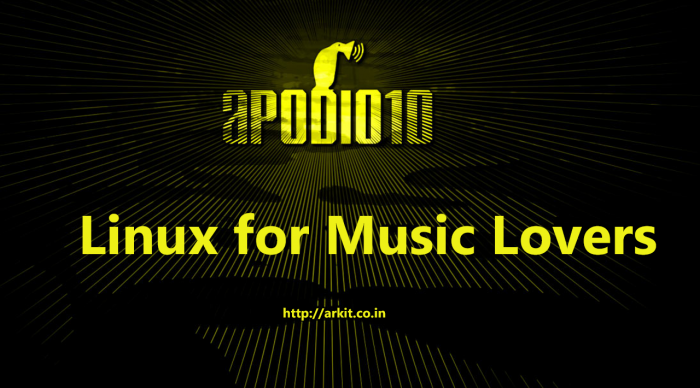 APODIO is ‘live CD’ projects – distribution versions of Gnu/Linux operating system, which boot on any PC laptop or desktop, including the intel-based Mac and x86 netbooks. This distribution is dedicated to creative multimedia tools for audio/video processing and real-time performance and aims to provide a full set of tools for the average media artists needs. Apodio initiative also draw attention to the practice of developing custom GNU/Linux distributions tailored for specific uses such as media production, audio/video streaming, hacktivism, art installations and more.